Reviews, comments, and the occasional blog postings about books and reading. Author Tim Waggoner continues the antics of his Shadow Watch series with this second installment, Dream Stalkers. I really enjoyed the first book, Night Terrors, and wondered if Waggoner could follow it up with something equally crazy/intriguing/scary/funny. The answer is – he did. In this book, Shadow Watch agents Audra and her incubus, Jinx (a blood-thirsty clown) fight against a drug called Shut-Eye that has been making its way between Nod and Earth. Their investigation will take them deep into Nod, to a secluded place where the worst of the worst nightmares are imprisoned. They also partner with some new characters that rival Jinx for frightening creepiness. To complicate matters (as if there needed to be anything more than fighting off nightmares come to life), Jinx and Audra are experiencing a side-effect from their partnering — they switch bodies, without warning. In the middle of a fight, or while interrogating someone, they might find themselves in the others’ body. This provides plenty of opportunity for some of Jinx’s hijinx. Waggoner has created a tremendously fascinating world where living nightmares are common-place. Yet I hesitate to call this a horror novel. It is a mystery with a dark-urban-fantasy setting. And I think that this book is actually stronger than the first book. The first book helped set up the world and the characters but in this second book, we get a much better look at the characters and their growth. We come to understand the partnership between Audra and Jinx better, and it is their character(s) that carry this story. No matter how fantastic the setting, if we don’t like Audra or Jinx, we could never buy in to the story. And here Waggoner really shines. It would be very easy to go over-board with Jinx, making him foppish or silly. But as terrifying as he is and as unpredictable as he might seem, he’s actually a well controlled character who knows when it’s appropriate to be funny or dangerous (and unpredictable), and when he needs to contain his insanity. Audra fought quite a personal battle in the first book and fate doesn’t let up on her as she tries to understand her relationship with her own personal nightmare, now sometimes sharing his physical form. This part of the story is developed nicely and still leaves plenty of room for more detail. I was very happy that we got to spend a little time in the incubus bar Wet Dreams. I’m sure this is a favorite watering hole for many readers. There’s plenty of violence and plenty of laughs in this wholly original series. I really enjoy coming to visit this world (but I wouldn’t want to live there). Looking for a good book? 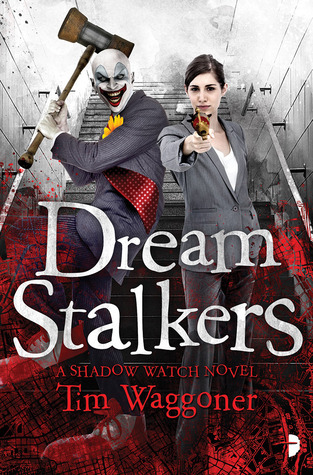 Dream Stalkers, by Tim Waggoner, is the second in the Shadow Watch series and will take your breath away with its fast-paced, terrifying, outrageous, humorous action. It’s a must-read for dark fantasy/urban fantasy fans. I received a digital copy from the publisher, through Netgalley, in exchange for an honest review. Want to see if I've reviewed a book here yet? Just try the search menu below, or click one of the book tags. Today is National Film Score D… on The Fog of Ward. A writing life cut open. a wayward soapbox for the expat Australian, Tokyo-based journalist/author/DJ/muso/hack writer & crap comic artist also known as Little Nobody.